Without knowing it, you may be doing small things that negatively impact your job search. Find out how to avoid them in this blog post. Companies often combine military spouse hiring programs with existing veterans hiring programs. 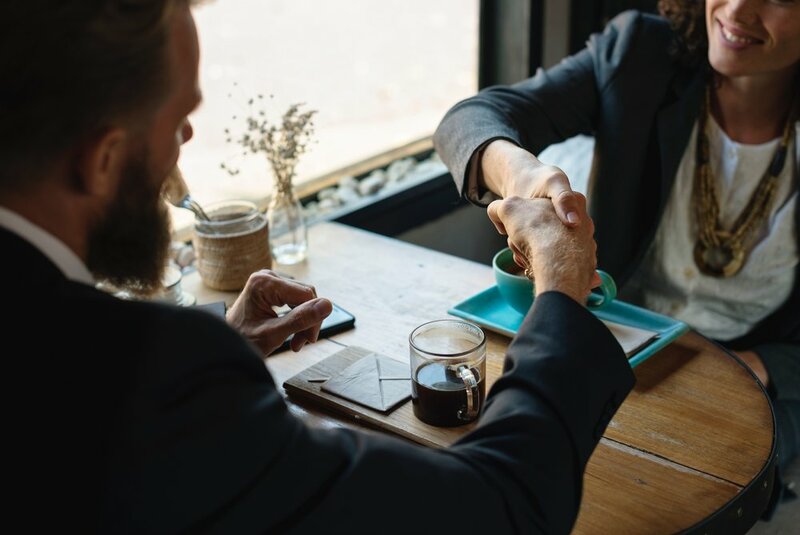 We talked about this earlier this week in a blog post and here is Marcelle to share more about why companies miss the opportunity to hire exceptional candidates when making this mistake. Find out how military spouses and military veterans are different and what this means to your new hire recruiting efforts. A recent NY Post article featured a spouse that ServingTalent placed, and that same article explains exactly why we do what we do. Hiring a spouse should not be part of a veteran hiring program. Spouses have extensive private sector work experience like the traditional candidate pool. Hiring a spouse is not a CSR initiative or charitable donation. It’s part of the hiring and investment strategy for a company’s future. Our company doesn't just talk about military spouse employment, we get them hired. 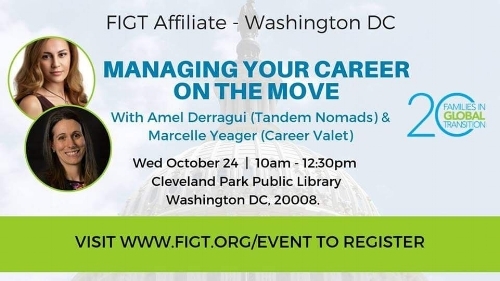 On October 24th ServingTalent and Career Valet CEO Marcelle Yeager joined the DC affiliate for Families in Global Transition and Tandem Nomads to present on managing your career on the move. Her presentation on Strategic Networking for Your Ideal Job encouraged military spouses and US Foreign Service spouses to use their vast networks to build their ideal jobs. Today in National Flex Day. We are proud to join FlexJobs, 1 Million for Work Flexibility, and other leaders in support of work flexibility. At ServingTalent we are passionate about work flexibility and understand its value for our country’s workers, particularly the Military Spouse and Foreign Service Spouses that we serve. It is a smart and sustainable business strategy that improves the readiness of the Armed Forces and State Department and enables businesses to find highly skilled, adaptable employees. LinkedIn can be intimidating if you haven't used it at all or had much experience with it. Even if you have, the experience of trying to update or revamp it can be stressful, much like writing a resume. Knowing which sections matter the most for recruiter and employer searches is important. You also need to know how to develop content to maximize your impact in the space available. If you're looking to be found, the first thing to check in your profile is that your contact information is visible. Include your email address and anywhere else you'd like to be found (Twitter, Facebook, blog or website) to the contact information section of your profile. If you don't, you may miss out on opportunities. 1. Professional Headline. There are two ways people use the headline on LinkedIn. Some use their current or past job title while others choose a descriptive headline that summarizes their professional background. What's best for you depends on your goals and how you intend to use LinkedIn. For example, if you're using it for work, marketing or business development purposes, you should use your title and company name in your headline. If you're job searching or always keeping your eyes open for new opportunities, it's better to use a descriptive headline. LinkedIn allows you to use 120 characters, so utilize as much of that real estate as you can to explain the main skills, degrees or experiences that define you and what makes you unique. 2. Summary. This is probably the place on LinkedIn where people have the most trouble. Summaries vary greatly for this reason. Some folks overshare, and it can become a bit too personal for social media, let alone a professional site. Others use generic phrases, like "driven and self-motivated project manager," which sound too stiff and not personal enough. What's the middle-of-the-road solution? Provide an example, or several examples, of specific work you've done and use metrics wherever you can. If you don't have numbers to demonstrate your achievements, you can say how you've helped your company do something or how you've made a difference in your community. You'll have space for generic skills and phrases in the skills section. Include your passions in the summary and why you chose your field and what you love about it. Let people get to know you professionally with a hint of your personality or interests. 3. Experience. Another key section of LinkedIn is work experience. Many people leave the job description fields blank under their job title, company and dates. This is a mistake unless you are prohibited from doing so. Some industries and firms almost exclusively use LinkedIn instead of resumes. Therefore, you should treat your LinkedIn job descriptions as seriously as you do in your resume. What did you do in your jobs, and what impact did your work have on a process, team, person or the company? Use key skills and phrases from your line of work as much as possible here. 4. Skills. This section can be complicated because "skills" can mean anything from technical to industry to other professional expertise. You should include everything in which you feel confident. Think about the knowledge you have in your field and other skills that are likely important to employers you may target, from computer skills to technical and professional skills. This is also the place to put the generic skills mentioned above. But don't go overboard. "Oral and written communication" is fine, but "excellent time management" sounds silly. Avoid adjectives when listing your main skills. 5. Additional Information. This is your chance to show a more personal side. What activities do you enjoy outside of work? If an employer views your profile and the profiles of several others with similar educational and professional backgrounds, and something in this section piques their interest, they will want to talk to you. If you are unemployed, you're probably wondering whether to leave your last position's dates as "to present" or put in your end date. Many recruiters will tell you to include a job entry, even when unemployed. The reason for this is that many of them will limit their search for candidates by checking the "current title" box. To avoid being missed, you can create a mock job listing in the current job section. This should include the job title or titles you are looking for. In the company name box, you can write "In Transition" or "Seeking New Opportunity." Focus on creating unique content for the sections above, and you will have an above average LinkedIn profile. Keep it professional but not too stiff or generic, and you'll be well on your way to getting noticed by recruiters and employers. If you are still stuck, check out profiles of well-known executives or LinkedIn's top-rated professionals to get an idea of what a great profile looks like. Originally Published on US NEWS by Marcelle Yeager. This week we’re focusing on assessing your job search, and making necessary adjustments based on your findings. Marcelle shares more in this video for ServingTalent and Career Valet. This is a quick trick to make sure you get as many opportunities as possible on LinkedIn. One of the hardest parts of the job search is finding out about openings or positioning yourself to see them before others do too. We recommend getting ahead of the game by signing up for job alerts at sites specific to your career field, and more general sites. Sign up for job alerts with position keywords, location selection, and mileage willing to travel (this site aggregates postings from many major sites, including Monster, CareerBuilder, ZipRecruiter, Indeed and others). You may need to set up multiple alerts. You can cancel alerts at any time. The following tips may seem obvious and silly, but it's a good checklist to use before you hop on for a phone or Skype interview. Small missteps on your part can literally break an interview. If you're well prepared in the knowledge department but not the pull yourself together department, you aren't likely to move forward in the hiring process. For real. 1. Wear a fully presentable outfit. What we mean is: don't wear sweats and slippers on the bottom because you think the person will only see your top. What if you have to stand up during it? Even if you are on a phone call, wearing work clothes gets you into a business mindset. 2. Check your Internet and phone. Check your internet connection and that your phone is charged 20-30 minutes before the scheduled interview. Log on to Skype for the interview 5-10 minutes in advance. Be prepared for technical failures and have a backup plan. If Skype doesn't work on your end or theirs, is your phone charged and ready by your side? Turn off phone notifications and put it on silent for the duration of the interview. Do not check messages or anything while on the phone interview. Focus. If you've had an emergency occur or you are feeling very ill the day of the interview and still want to push forward with it, please reconsider. Stress comes across more easily than you would imagine. It's better to explain the situation and reschedule so you can put your best foot forward than blow your only chance to make a first impression. Marcelle Yeager, CEO of ServingTalent, has joined the Washington Network Group's Career Development Roundtable Steering Committee. In this role, she will help advise the founder and chairman on professional development topics and programs. Here at ServingTalent we emphasize the importance of a good interview to our candidates. It's your best chance to make an impression and get the offer you have been working towards. One of the best ways to prep for an interview is by having answers ready for common questions. Even if these exact ones aren't asked, chances are that similar ones will. 1. Tell me about a time you made a mistake. 2. Tell me how you handled a difficult situation. 4. Why are you looking for a new job? 7. If I called your boss right now and asked them what is an area that you could improve on, what would they say? 8. What makes you uncomfortable? 9. What are some of your leadership experiences? your mind, do these two simple things to get started and feel like you’re on your way to the next great thing. recommendations. Do not simply type your job title into the headline! the skills you’d like them to focus on when writing it. focus your resume and cover letters when the time comes. have (or 2nd degree LinkedIn connections) or alumni groups. 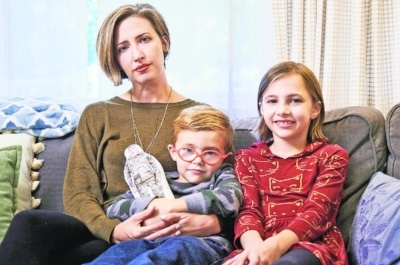 "It’s unusual, to say the least, to interview for a job when you are a new mother to eight-week-old twins and you’re about to move across the country for your husband’s military job. But that’s just what Kara McSwiggin did in early 2017. An experienced certified public accountant, McSwiggin scored an interview through the recruiting firm ServingTalent and landed a job with Blumer CPAs, where she could keep her skills fresh and stay in the career game at a time when many other women jump ship." As military and foreign service spouses, you've probably done unpaid work at some point in your life. Maybe you volunteered for the unit or organization your spouse is associated with or helped out at a local nonprofit. Many of you hold positions on committees or in organizations. While this work is not paid, it's no less important than paid work. Forget about distinguishing between the two when it comes to telling your work history. Think of them as one and the same. If you must list salary on an employment application or it's requested for a federal resume, include that information, but for all other purposes, paid and unpaid work is equal. Below are different types of unpaid work and how to include it on your resume. Once you're far beyond school years, you can be more strategic about the portrayal of your volunteer experience. If you hold leadership roles in the community, you may want to create a section after Work Experience entitled Community Leadership and list the details of your roles. For other types of volunteer work, simply list it under Additional Information at the bottom of your resume; include the organization and your role. If you haven't volunteered for an organization within the past few years, it probably doesn't make sense to include it. There are many reasons for taking time off work – having children, caring for elderly relatives, or moving due to a spouse’s relocation. If you've taken on volunteer work during this time (anything from work in schools to religious organizations), include it as you would any job under Work Experience. Be sure to put together a few bullets to describe the work you did and its purpose or impact. If you're switching careers to the nonprofit sector or anything that requires a volunteer base, it's even more important to showcase your unpaid work. You might consider putting a Volunteer Experience section directly under your Career Profile at the top of your resume to ensure it's not missed when you submit your application. An employer needs to know that you understand that world in order to break into it. Military spouses and foreign service spouses should always remember to include these types of work on their resumes, it can help fill gaps in careers, or show flexibility to a potential employer. For more tips on including volunteer work on your resume, check out our Facebook page this week! You’ve likely heard by now that you have to tailor your résumé to every job you apply to. This could very well mean you have a stockpile in the double digits, if not hundreds. And you might feel that for this amount of effort, you’ve had little success. It may be time to take a step back and understand what tailoring a résumé to each job means and how to do it better, which will save you precious time. 1. Create a clean master résumé. This is a staple for all job seekers, no matter what stage they’re at in their careers. You need one solid version with everything from your background that could reasonably be used in a résumé. However, the master résumé is not a dumping ground for every piece of job-related history. In order to save yourself headaches later when it comes to application time, clean it up now, and keep it that way as you add to it in the future. Record all jobs and internships, education, professional training, licenses, certificates, awards, volunteer work, professional affiliations, languages, publications and technical knowledge. Put as many details as you can in this version, from dates to locations to duties. Go beyond just your job or internship tasks, and include the impact of your work, whether it’s quantitative or qualitative. To keep it clean make sure the formatting is consistent now, and fix any grammatical or other errors. 2. Dissect the job description. So you come across a job posting, and you’re ready to apply. Read the description closely and highlight the required and preferred qualifications. If you meet the majority of required qualifications, it’s likely worth your while to apply. 4. “Save as” and delete. Once you feel you’re qualified for this job and have a good grasp of what the employer is looking for, it’s time to look at your master résumé and “save as” a new version. Keep only duties and accomplishments relevant to the job posting. If you’ve held jobs in a similar type of company or industry, don’t delete those. 5. Adding the infamous keywords. “Keyword” now has a bad connotation in the job-searching world, but it’s not as terrible as it seems. Take a look again at the portions of the job description that you highlighted. Where you see a match with your experience, check the wording of the posting against what’s in your master résumé. Do you use the same terms or synonyms? 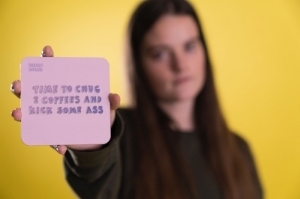 If you don’t have the same words or phrases, make some replacements. However, make sure you do it in a meaningful way, and you won’t only get through an applicant automatic tracking system, but also past the deciphering eyes of a human reader. 6. Review, and then review again. Like you did above when you created your master résumé, it’s critical to review your work. You cannot assume that since you deleted information from your solid master copy, everything went smoothly. Technology does have its faults, as do humans. It’s essential to look over the résumé with a fine-toothed comb, and best to do this with a hard copy. Make any changes necessary, and then repeat the edit process after taking a break for an hour or, if you have the time, a day. Try not to edit if you are exhausted after a long day at work. If it’s a job you’re serious about, you want to submit the best product possible. Remember that this is the first impression the employer will have of you, and it needs to be good because you will not have a second chance. In truth you need only one résumé – the master version – and the others that stem from that are variations. Once you get the hang of dissecting a job description and identifying keywords, it will be much easier to create new versions when applying to jobs.